Happy Friday! I absolutely adore these faux fur cuffs. They are the perfect addition to any pair of boots or to any coat. You all know I love my faux fur, so I'm always ready to try any new way to add a little to an outfit. The cuffs can be found here and they come in the most adorable little pouch. They are lined with plaid and they couldn't be any cuter! They come in a few colors, mine are the 'Grey Wolf' color. I've been wearing so much red lately, getting into the Valentine's Day spirit. I haven't talked much about this bag since I've gotten it, but it is seriously the perfect size and shape. It can fit everything you need (including a fresh bouquet of flowers). I love the red color I got it in. It adds a pop of color to any outfit. Hope you all have a wonderful weekend and a great Valentine's Day! It will be so nice to have an extra day off on Monday, I'm definitely ready for a long weekend! great Outfit! 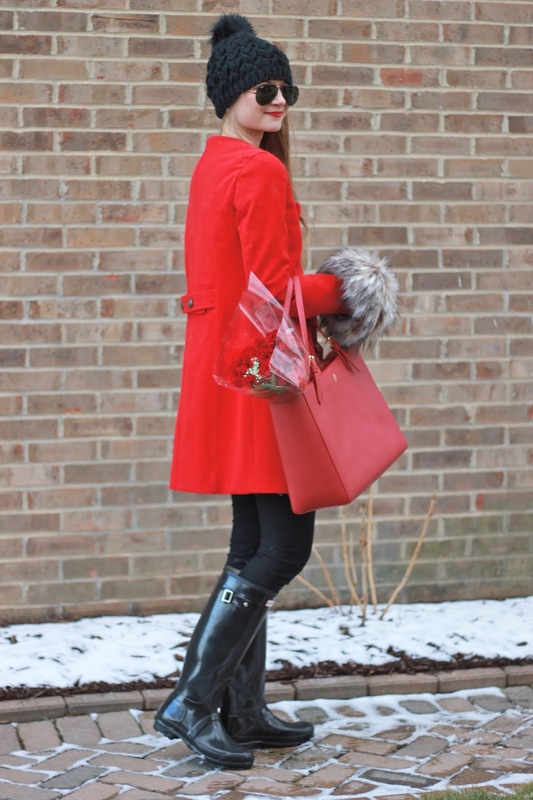 I like it very much, excellent combination of red coat and black hunter boots.